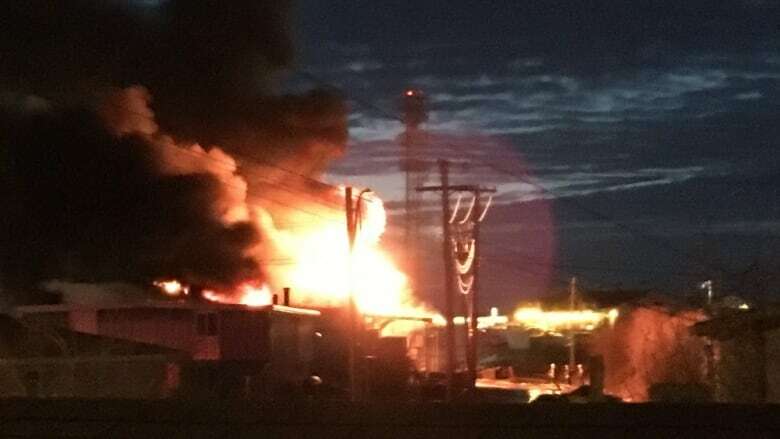 The person who reported a fire that destroyed Fitzgerald Carpeting in Yellowknife Sunday night first attempted to call 911 in error, according to a press release from the City of Yellowknife. According to the release, the individual "attempted to use a fire extinguisher to contain the flames at the back of the building but was unsuccessful. "After dialing 9-1-1 in error the individual drove to the fire hall to advise the YKFD (Yellowknife Fire Department) duty-crew in person." The Northwest Territories does not have 911 service, despite calls to examine implementation in 2015 by then-Minister of Municipal and Community Affairs Robert C. McLeod. Yellowknife city council unanimously approved a recommendation in 2009 to work toward phasing in territory-wide 911 service. The territory's department of Municipal and Community Affairs said in 2015 that the City of Yellowknife had expressed interest in becoming the N.W.T. 's 911 centre after nixing the option to create a brand new dispatch centre to deliver the service. The territory's lack of 911 service has been highlighted in recent years by a 2007 class action lawsuit brought against service provider Bell Mobility by two Yellowknife residents, who contended that Bell was charging a 75 cent per month 911 fee for a service that is not available. A judge ruled in favor of the residents in 2013, and that ruling was upheld on appeal in January of 2015. According to the City's press release, a total of 29 fire service personnel responded to the incident, along with a command vehicle, two engines, one rescue truck, and one ambulance. Crews continued to work on the fire into Monday morning, using an excavator to "prevent unmonitored collapse of the building and to gain access to any hot-spots." The Office of the Fire Marshall is currently investigating the cause of the fire.